Operating since 2011, GTbets is an online and mobile sportsbook brand that focuses primarily on giving people a no-nonsense interface with simple promotions and simple betting that keeps things from being more complicated than they need to be. This gives players more of an opportunity to focus on the games themselves instead of trying to figure out how to use a website or mobile app. They are licensed in Curacao, and they accept players from the United States as well. The welcome bonus at this sportsbook is pretty straightforward, and it's worth 100 percent up to $250. There is a simple play-through requirement based on points that are earned for different types of wagers. Tons of other promotions are available on a regular basis including reload bonuses that range from 5 percent to 50 percent that are automatically added on to your deposit. You can also select your favorite team for a given season to get special offers on bets on their games exclusively, an innovative type of promotion that we've never seen available anywhere else. The web-based interface is very easy to use. They have a list of sports leagues to choose from, and then all of the available games to bet on for that league is listed. There's a simple selection to choose between the different types of wagers, and the predominantly use money lines for expressing odds. Once you choose the bet you want, players will put in the amount of money they want to wager. They'll then be given a verification of their online betting ticket, and once that's confirmed, the bet is booked. The GTbets mobile interface is completely web-based, and this has a distinct advantage of giving players more options as far as choosing which type of device they want to bet from. No matter if your mobile device runs using iOS, Android, Blackberry or Windows mobile, and no matter if you use a smartphone or tablet, you'll have no trouble logging in and getting in on the action. All you'll need to do is navigate to their website, log in as usual and browse the available wagers. The interface itself automatically adjusts everything so that you'll have an easy-to-use menu system that fits your phone or tablet's screen perfectly. The selection of betting markets is largely geared towards North American players with a focus on those particular sports leagues. This includes the NFL, NBA, MLB, NHL and others. Soccer, tennis, golf, boxing, MMA, racing and political elections can also be wagered on in addition to other contests like horse racing, cricket and rugby. This is a good selection of betting markets without things getting out of hand in terms of just having too many options to sort through to find what you're looking for, and it's geared almost exclusively to professional sports leagues instead of college leagues. The rewards program for GTbets is powered by GameTimeRewards. This allows you to accumulate points from all different types of betting, both mobile and desktop, or across their other properties for poker, casino, etc. There are three levels of the rewards program, but it's all based around exchanging your points for cash. It's a straightforward program that doesn't suffer from a ton of red tape and fine print like many other rewards programs do, and it's perfect for players who want a no-nonsense approach to what amounts to getting cashback on their wagers. Visa, MasterCard, bitcoin, gift cards, direct cash, Skrill and Neteller are the most popular betting options here. They have a good reputation for fast, reliable cash outs, and they will really work with you to help you make a deposit if you're having trouble. They also have a really strong customer service program, and this includes telephone, live chat and email options. We contacted their customer service team to ask a few questions for this review, and we were given quick service through the live chat option with friendly replies that weren't pushy at all about making a deposit. 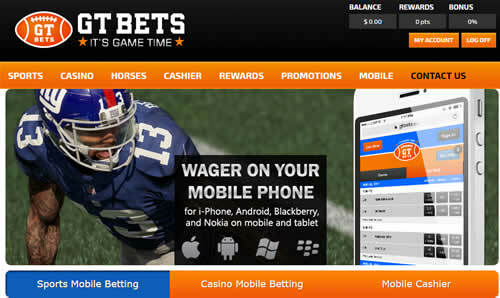 GTbets has an attitude that centers around getting players the chance to bet using their mobile devices while cashing in on promotions and getting a lot of value through their rewards program without making it difficult on you. That's exactly what's needed in an industry where it seems like every other sportsbook is only interested in making things more complicated. With a strong reputation and a high degree of popularity, it would seem that their approach that is geared towards simplicity has quite a following. Overall, if you're a fan of the major sports leagues and you don't want to deal with a bunch of fine print or extra options that you aren't interested in, then GTbets is a great place to sign up and place your wagers.